The Hollies said it best in the words of a song: “The road is long with many a winding turn.” The road, after traveling it for eight years, has indeed become long, and tedious, for me. My weekly 125-mile trek down the freeway to a small West Texas college, where I attempt to instill the joys of literature into the uninterested hearts of ersatz students, is more like a journey into the heart of darkness rather than analogous to Christian’s search for the Celestial City. There is no salvific reward for me, except disappointment, at the end of my travels. As for turns, there aren’t many. The interstate is mostly a straight shot to my destination. Over time, though, the road has fallen into disrepair, and for the last few years, in at least two sections, it has narrowed down to one lane so that workmen can concentrate on smoothing out the other one. Cars, and especially trucks of all makes and sizes, break about every driving rule to beat one another to the bottlenecks. Many risk their lives just to get one car length ahead. Once in the constricted areas, antinomian drivers tailgate the car in front of them to urge law-abiding citizens to higher speeds. The trip west, in addition to its monotony, has become nerve-wracking. But I have discovered a delightful, distracting detour that leads away from the chaos. About thirty miles before my destination raises its woebegone visage on the horizon, State Highway 193 – the Gordon exit – shoots off to the northwest. At this juncture sits Trolley 373, an actual old streetcar, painted blue and white, once a restaurant that served some of the best barbeque in the state of Texas. It has long been defunct, but the advertisement for food still beckons the unsuspecting traveler. The highway traverses a wooded area for about three miles before it curves west to parallel the freeway. I have seen only two houses along this route. The copious woods are interspersed with occasional pastures full of grazing cattle. The road bisects an oil/gas industrial complex, but early in the morning when I am in the vicinity, there is no activity in the yards. Right before the road curves into Gordon, I observe the Union Pacific Railroad off the right. Gordon, population about 600, is the first community I come to. Highway 193 runs next to the railroad tracks into town and intersects FM 919, Main Street, at a four-way stop sign. To the left is the downtown area, old buildings occupying both sides of the street. One structure holds the proverbial town café, where the village intellectuals gather to both discuss, and sometimes find answers for, the world’s pressing issues. The café opens early, no doubt to give its denizens plenty of time to exercise their problem-solving skills and plenty of coffee to force them to stay awake while they do so. To the right of the intersection are the tracks, and beyond these Highway 919 turns sharply to the left followed almost immediately by a turn back to the right. At this second turn stands an automobile dealership with its accompanying garage and lots. The road now heads north where it rises gently to cross some impressive and beautiful Texas hills. Back at the junction Highway 193 continues west. There is a siding on the Union Pacific, and frequently a boxcar is set out for a local merchant. The railroad has been replacing its crossties for some time now. Stacks of them occupy the area between the road and the tracks. In no time I’m out of Gordon. There is a peace associated with this little town: no traffic to speak of, no loud noises, no apparent rude drivers, none of the harrowing scenes I experience on the interstate. Some wit might be tempted to quip that Gordon is a place out of time, but this hypothetical snide thought sounds like a compliment to me. Beyond Gordon, trees border the highway on the north and scrub brush on the south. A noticeable hill stands up in one field, a marked contrast to the flat fields surrounding it. The railroad is visible through the trees, and often I see a train because this important route handles some twenty-five consists per day. I observe no houses along this six-mile stretch. Only as I approach Mingus do any signs of civilization appear. Mingus is a small village of less than 300. It was once much larger than this due to the nearby abandoned town of Thurber. 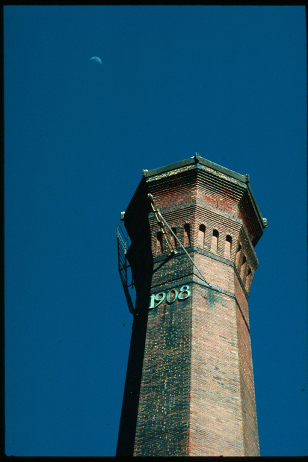 Thurber, for about thirty years between 1888 and 1927, was a coal mining nexus that could boast of modern conveniences such as electric service and brick streets. In fact, a brick factory supplied paving material for several towns in the neighborhood. Thurber reached a population of 10,000 at its zenith, but the mines dried up, the people moved away, and the town was totally razed in 1933. Today, few artifacts remain of this previously booming metropolis: two restaurants – catering mostly to tourists and hapless freeway travelers – an old train deport that was actually moved in from Strawn, a small city park, and a new museum built by Tarleton State University. A branch line of the Texas and Pacific Railroad ran the four miles from Mingus to Thurber. As Highway 193 merges with Highway 108 at Mingus and the road makes a sharp curve to the north, I can see the embankment of this old spur line right before I cross the modern Union Pacific tracks. Mingus looks almost deserted. 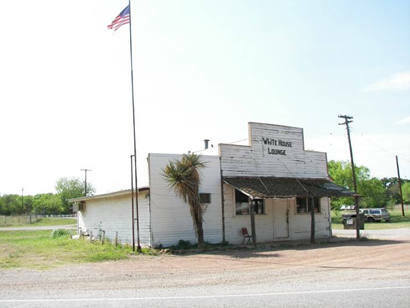 There is a small post office at the highway intersection, a convenience store along Highway 108 – Main Street – and an old Opera House, a relic from the nineteenth century, now gutted but with its walls still standing on the corner of Main and Highway 193. Hopefully, there are plans to restore this structure. I imagine many an interesting tale comes out if its history. The principle attraction of Mingus today seems to be a honky tonk where the locals go to relieve their frustrations after a week’s labor. After crossing the tracks on Highway 108, I take a quick left turn to the west, pass an old boarded-up church, and then curve back to the right on my way to Strawn. For about two miles the road keeps to the north. It goes through a densely wooded section, fords a creek, and breaks out into the sunshine, where I can see several farms and ranches with some rolling hills forming the background to this bucolic scene. The highway gradually turns to the left, west, where it parallels both the interstate about five miles to the south and the railroad tracks one mile distance. I see neither from the road. The way into Strawn is a gratifying drive. As I get closer to the town, I start to see more houses. I pass a factory on the south which manufactures various types of construction equipment and that must provide many country residents with job opportunities. Farther down the road I see the rare phenomenon of a candle plant. Actually, the alluring aroma attracts me long before the physical plant comes into view. The candles are sold throughout the nation, and they give Strawn the small reputation on which the chamber of commerce can brag. I am now at the city limits. 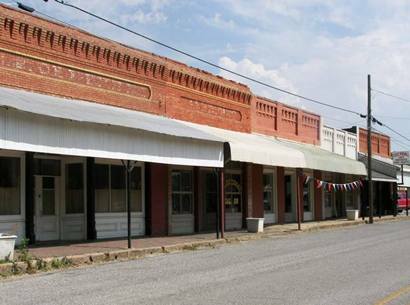 Of the “tri-city” layout through which I have passed, Strawn is the largest town, but still with a population of less than 1000. It has the appearance of having been larger at one time. I go by some beautiful old homes before I reach the central business district. A burned-out florist shop and the post office are next to each other on the right. I see the community center on the left, then a row of buildings, another of which has been the victim of fire. I reach the end of Highway 108 as it junctures with the main north-south Highway 16. All the downtown streets are brick-paved, undoubtedly with the bricks from the old Thurber plant. When I turn left, south, I notice an old bank building on the west side of what is now Central Street and some shops on both sides that sell antiques and the local-made candles. There is a vacant lot on the left where the Strawn Theater once stood. It too burned long ago. Strawn seems to have more than its share of fires. Highway 16 takes a ninety-degree turn to the right, then immediately another one to the left to cross over the railroad tracks. The roads in this part of the country have so many right angle turns that I think of the term “orthogonal land” as an appropriate moniker for the landscape. 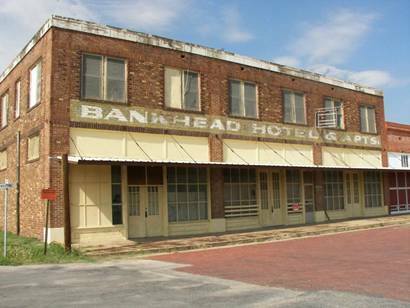 Off to the right, before I cross the tracks, sits the old Bankhead Hotel. It is empty now, but its size leads me to think that in the past it was a haven for weary travelers on their east-west journeys across America because Strawn was on this old route before the freeway was built. At the railroad crossing a short spur siding branches off the mainline tracks. It bends around toward the south. I have seen at times two dormitory cars set out on this line to house railroad workers. Mostly, though, the line stays empty. To the east of the highway stands the local convenience store and gathering place for the “foolosophers.” A short distance down the road stand two of the area’s popular restaurants: Mary’s and Flossie’s. They are across the road from each other. In addition to serving authentic Texas cuisine, they offer liquid spirits – the only places for miles that do so – for many imbibers. 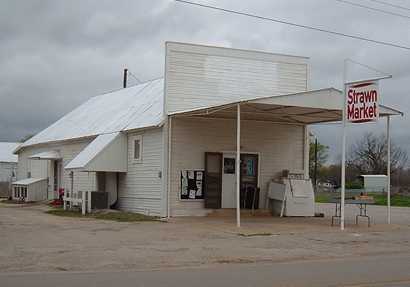 Next, on the right, sits the Strawn Market, a combination gas station-grocery store that still serves the community after many years in business. I now head out of town to rejoin the interstate. It is four miles to my personal Via Dolorosa, the last few miles to the campus. Once there, I face four days that I can barely get through. The school represents the way America appears to me today: student attitudes indicate that our citizens think they deserve certain rewards or gifts in life without working for them. Entitlement reigns supreme, even in academia. I’ve just about had it. The road has been long to my dubious destination. But the sixteen-mile delightful detour reminds me that there once was another America, a wistful place full of pleasant and pensive scenery, not a jungle of concrete highways and twisted lives. For my own sanity, I now travel it every week.